My grandson, Evan is eight years old, and he’s now a third grader. Where does the time go? He’s filling his big brother shoes quite well. His baby sister is already 17 months old, and he’s got his hands full. Evan can say the darndest things sometimes, and I wanted to share his worldly thoughts with you here. Enjoy!! He’s driving with his Mom ,and they have the phone on speakerphone. My daughter chimes in that they are driving along, Evan has a calculator in his hands, and they’re talking about how old everyone will be in 10 years. Getting back to my conversation with Evan I say, “How old will I be Evan?”. Evan replies, “63 Grandma. That’s really old.” I tell Evan thanks for brightening my day, but I think I’ll start telling people I’m 53 years young and not old!! He laughs, and then goes on to figure out how old his Papa, and Nana (my Mom ) will be in 2024. A good math lesson for Evan, an eye opening conversation for me! May 25, 2013 – The grandkids were over for a visit this past weekend. It’s always a treat when we get to see them, and see how much they are growing and changing. Evan’s baby sister is growing by leaps and bounds, and start to babble a little bit. She’s saying, “Ma-ma, Da-da”, and sometimes “ba-ba”. Evan was reading to us, and afterwards I said, “Won’t it be great when your sister starts talking, and you can have a conversation with her?” Without missing a beat Evan says, “Yeah, because then we can play rock, paper, scissors together”. I’m still laughing as I type this. He’ll learn soon enough. Once his sister starts talking the conversation will be non-stop. Happy Monday everyone! March 8, 2013 – Last week at Camp Grandma it was a rainy Friday, so there was no playing outside after school for Evan. He asked if he could play a game on my iPad, which he does frequently when he is here. I told him he could, and he had to bring me my iPad before he could start playing any games. You see it’s password protected, so a certain someone cannot just get on my iPad without me knowing. While I was punching in my password, baby Madison just happened to be sitting on my lap, and Evan said, “Grandma, how come Madison can see the password, and not me?” “Because, Madison cannot read the numbers yet, Evan”, I replied. I’m still laughing about this one. At any given moment Evan will practice his negotiating skills, which is a good life lesson, but does not work with this Grandma. Happy Monday everyone! February 24, 2013 – A week or so ago my daughter posted a short video to our family page on Facebook. She tries to post short little videos of Evan and his baby sister a couple of times a week. This is a great treat for the long distance relatives, and our Travel Man to see. Plus the rest of the family just plain enjoy them all. In this particular video, Evan is tickling his sister on her tummy, and we hear her first little giggle. So sweet and innocent, and cute. Once Evan realizes he can make her giggle he repeats the tickling a few times, and she giggles, and giggles. Such a great “big brother” moment. After we saw the video I asked Evan, “What is fun making your sister giggle?” He replied, “Oh, it was no big deal.” Very non-chalant. Kind of like I do this thing all the time Grandma. For me it was such a sweet moment, watching this big brother coming into his own element, and learning how to interact with his baby sister. These grandkiddos can melt your heart without any warning. February 22, 2013 -Evan and I got hooked on watching the Pixar movie Brave after school this week. It’s a cute animated movie set in Ireland. Evan’s always thinking about what he wants the theme to be for his birthday, even though it’s not until September. He gets fueled by the fact that his uncle works for Party City. So we had this little conversation. Evan says, “Grandma I think I want the theme for my birthday to be Brave.” I told him how cool that would be we could all wear kilts and dresses. He didn’t think the kilt idea was so great, and immediately he said, “How about a Power Rangers birthday, Grandma?” I just love the seven-year-old mind. February 8, 2013 – This morning Camp Grandma 2 had a few hiccups early in the day that took me back to my memories of getting four kids out the door and myself to work on time, all before 8am. Yikes! Here’s how our morning started. Evan ate breakfast at home, but was hungry again and had a bowl of cereal here. He spilled a little of the milk, stepped in it, and got his socks a teeny, tiny bit wet. So he throws the socks in the dryer to get them dried out before we leave to take him to school. This is all happening at 7:55, we have to leave at 8:15. Then, Miss Maddy decides she cannot wait to have a bottle, so she is guzzling at 8:05, and Evan gets upset with me because he needs help fixing his shoe laces, and tells me he never gets help when he needs it anymore!! I just had to chuckle. Evan got his shoe laces fixed, got to school on time, and Maddy is taking a nap. Life is good. January 25, 2013 – A few weeks ago Evan told us a joke. We’ve taught him a few simple jokes and then he has tried to make up his own over the years. He is quite funny. On this particular day Evan said to me, “Hey Grandma I have a joke for you.” I reply, “That’s awesome Evan, what is it?” Evan says, “When do astronauts each their lunch?” I say, “I don’t know Evan, when do they?” Evan replies, “At launch time!” Perfectly delivered punch line, and we were all laughing in unison. Telling jokes, Evan gets it, he likes to make us laugh. Happy Friday everyone. A New Year has arrived – January 7th, 2013 – It’s time for some updated Evanisms. I had the good fortune of babysitting my grand kids over the weekend. They stayed with us for a few hours on Saturday evening. 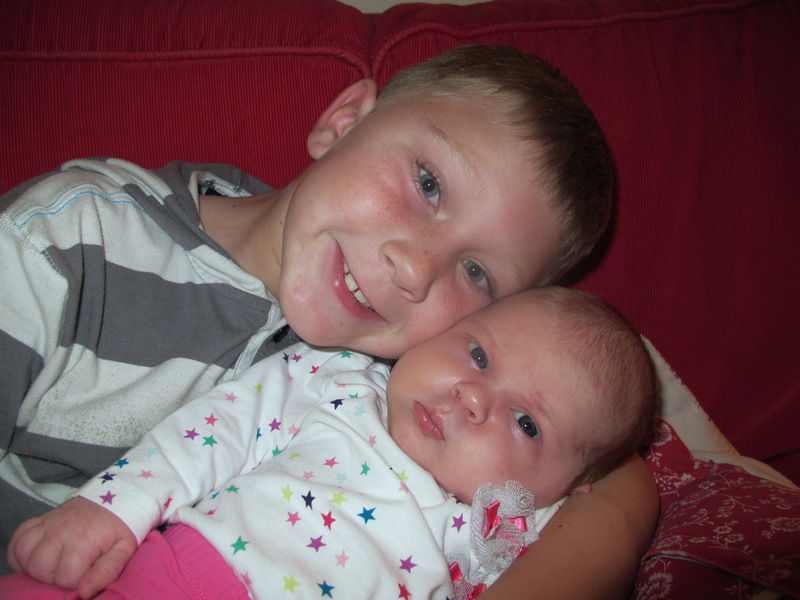 We’ve had a lot of colds flying around since Christmas so we have not seen too much of Evan and his baby sister. 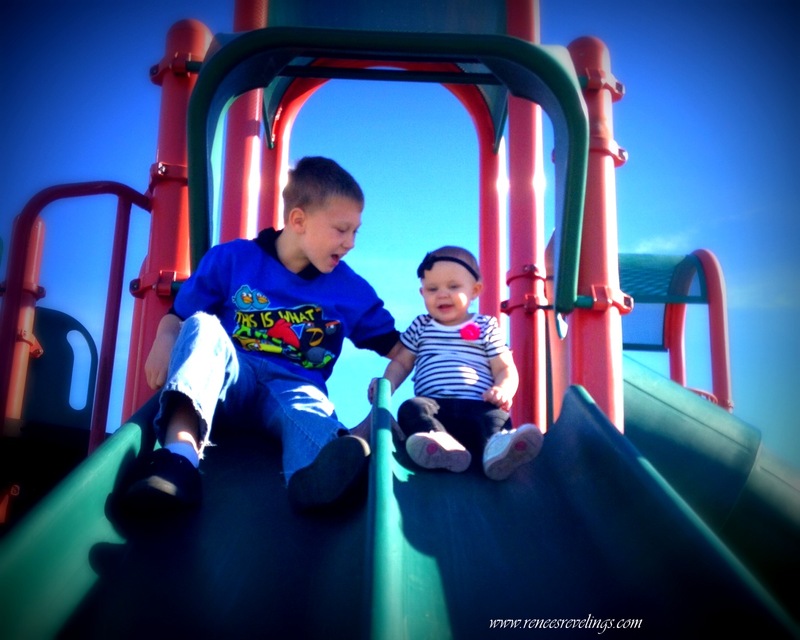 Evan is a sweet big brother and is learning all about his new family dynamics. He explained to me how I can tell when his sister is hungry. Evan tells me, “When she is crying and she can’t breathe, Grandma, that means she’s hungry.” Translation here is that when baby sister is so upset about not getting what she needs, she cries loudly, her face turns bright red, and then she takes a deep breath for round 2 of crying. We do our best to get her bottle to her before round 2 begins!! November 5th – Oh wow it’s been awhile since I have shared an Evanism with you. Evan stopped by with his parents after school today. (They are anxiously awaiting the arrival of Evan’s baby sister!) Evan walked in the door and pronounced, “I bought four milks at school today, Grandma.” I said, “What do you mean Evan?” Evan explained, “I had a dollar, and I bought four milks, and I brought one home with me.” He was very excited that he had gotten that many milks, and spent his whole dollar. As his Dad pointed out, he did not buy any candy or cookies, just milk. He is such a boy, such a second grader. I love this age. October 10th– I was talking to Evan on the phone a few nights ago, and he asked how his Papa was feeling (his Papa had a beach mishap last week). I told Evan he was feeling pretty good, but he was getting a little bored just sitting around. Without missing a beat, Evan said, “You need to play Parcheesi with him Grandma, or Go Fish”. I told Evan it was a great idea, and then he suggested his Papa could also play some video games. Great seven year old ideas! I’m sure there’s a Parcheesi game in Evan and his Papa’s future. Summertime 2012 – There is a funny Evanism that I forgot to share from a beach adventure over the summer. I was reminded of this story earlier this week by my Travel Man. When we drive to the beach there is a portion of the drive where we take the side streets to Pacific Coast Highway. On this portion of the drive we see a “Google” building. This is a landmark for Evan because when we see the Google building he knows we are close to our destination. On one of our drives this summer we got to the Google building, and Evan says, “Hey Grandma, there’s the Google building. That’s where they keep the internet.” Such a grandson moment. Isn’t funny how familiar kids become with what surrounds them? Happy Saturday to all. September 22nd – Evan celebrated his seventh birthday today. This post is more of an “observationism”, instead of an Evanism. Two sweet moments that I wanted to share with you all. The first moment was Evan waiting by the front door for his friends to arrive. He had a “friend” party and then our usual family party. He was so anxious for his friends to arrive. 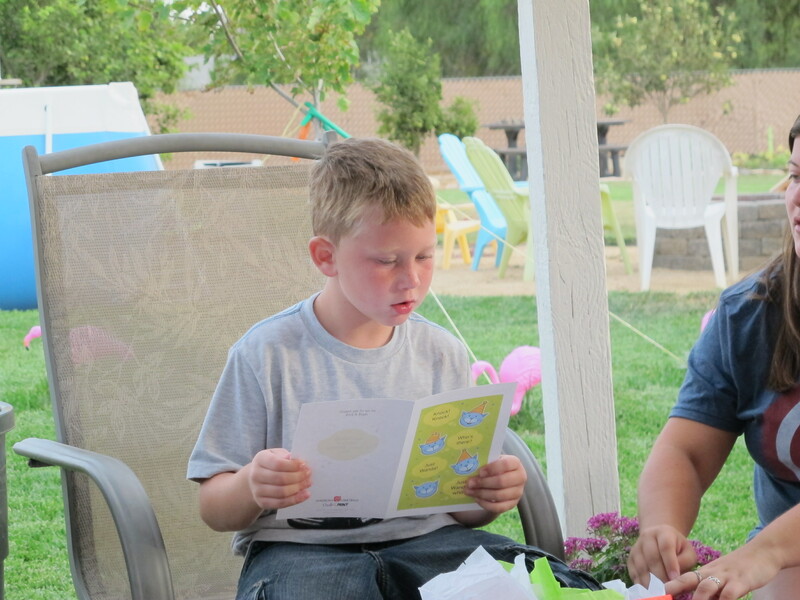 The second moment was when Evan was opening his presents at his family party. He read all of his cards aloud to everyone. Such a seven year old, second grader moment. So sweet. Happy 7th birthday grandson. September 21st– Evan got out of school early today. We went to McDonald’s for some lunch, and then on the way home he was singing a little song. He made it up as he went along, and I said, “Hey maybe you could write jingles for people when you grow up.” He saw a sign for Taco Bell, and started singing a little ditty about Taco Bell. Then Evan says, “I could write ringtones too Grandma!”, and he sings me a little song about his Papa! Then he’s quiet for a few minutes and says, “I’m going to have a building! I’ll call it Jingle Land.” I’ll make jingles for people there. It will be free for family, but everyone else has to give money. And I will have gift cards too. I say, “You mean gift cards for jingles?” “Yep”, Evan says. I think there’s an entrepreneur in our midst. Keep dreaming and imagining Evan. September 20th – Someone is celebrating his birthday this weekend. He is counting the days, hours and minutes until his birthday gets here. Today the discussion after school was about do we include today in the count until his birthday, or not. This Grandma tried to convince Evan that he did not need to include today, because the day was almost over. He though about it for a few seconds, and disagreed. We’ll most likely be having a similar conversation after school on Friday. Have a great weekend everyone! September 14th – If you’ve been following this page you know that Evan is going to be a big brother soon, in November to be exact. His Mom’s getting somewhat uncomfortable and in that phase of not sleeping well. Evan made a comment to me this week and said, “Yeah, my Mom’s always tired Grandma.” I told him, “You should try carrying around a baby sometime!” Then I suggested that maybe Evan should stuff a pillow under his shirt so he could see how it feels to be pregnant. So last night Evan tells me, “Grandma I took your advice, and put a pillow under my shirt. It is no fun being pregnant! How can a person sleep with a stomach that big!” Daughter, Naomi and I are still laughing. He took my advice!! Oh it’s fun to be the Grandma! Happy Saturday everyone. September 6th – (already!) – I’m in charge of Evan after school on Thursday’s and Friday’s. Today he had some homework to do before we could go swimming. I’m noticing that he is becoming much more studious as a second grader. In first grade he despised writing anything, especially if it required forming a sentence. Today, I noticed he was expertly writing his required sentences, and moving along smartly and swiftly. Nothing like the first grader who did not really care for writing. Oh what a difference a few months will make. My daughter will laugh when she reads this post. Evan got in some trouble tonight for lollygagging on the homework front, and his Mom called to tell me Evan will not be spending the night tomorrow. Better luck next week Evan! August 30th – Evan and his Mom stopped by the house this morning before he went to school just to say hi. Made my day. I have my recently harvested garden veggies sitting on the kitchen counter. Evan sees the zucchini laying there and says, “Grandma, you should cut some circles from those (meaning the zucchini), and put them on your eyes like your at the spa.” I’m laughing, and say, “Where did you see that idea?”. Evan replies, “Some magazine.” My daughter, Naomi and I had a big laugh over that one. We had to explain to Evan that you use cucumbers, and not zucchini. But you have to admit it’s creative thinking. Happy Almost Friday to all! August 22nd – Last night we celebrated Travel Man’s birthday surrounded by all of our kids and family. A great dinner celebration. Evan kept himself busy in our “game room” watching a little TV, playing some dominos, some boggle, and unbeknownst to me, playing with my P-touch label maker. When I walked through the room at one point during the evening I saw him on the couch with the label maker in his hands and asked what he was doing. “I’m just spelling the words from the Boggle game, Grandma”, Evan says. I replied, “Your not printing those out right?”. Evan says, “No just spelling my boggle words on the screen.” I didn’t investigate any further, and took him at his word. This morning when I went into the game room to pick up from the party there on the couch was this little pile of printed out labels with short little words from someone’s Boggle game. What was I thinking last night? This is my almost seven-year old grandson, who loves all things mechanical. Of course he’s going to press the print button when he spells a word. The joke was on me this time. August 7th- Well friends, tomorrow is the day. Evan’s first day of second grade. He’s excited about going back to school. He’s not so excited about the prospect of homework. Evan stopped by the house today with his parents. They had gone over to his school to see what classroom Evan will be in tomorrow. I was singing Evan a little song, “turn out the lights vacation’s over.” Evan sings to me, “Vacation’s over, and no more video games or TV!” He knows what’s up! He’s been listening! My daughter and I laughed at this one. Oh to be six-years-old again! Happy Wednesday friends.